This hose connector fits to all IBCs and canisters with S60 coarse thread. The matching hose is s-kr-1z, the corresponding hose clamps are ss-20-32. 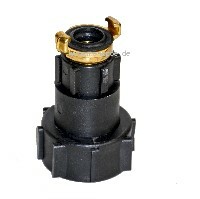 The Geka-connectors suit for a large varity of liquids, they are proven through the yeaars and they stand out due to their robustness.